I made this dish recently as a welcome home meal for my grandmother who was returning to her house after being in nursing home rehab all summer long. We invited her best friends to join her, my mom, and me. When it was time to serve dinner, I got nervous cooking for everyone, but it turned out just wonderfully. Folks had seconds, and everyone had very complimentary things to say during the meal. Mary even wrote down the recipe before she left that night so she could make it at home, too. I think that’s an excellent compliment. I’ve also made this dish to take to friends who had just had a baby so I think it travels well also. There are two variations in the marinade, and I’ve made both so I’ll share how they each turned out along with their pluses and minuses. Give both a try to see what works for you! 1. 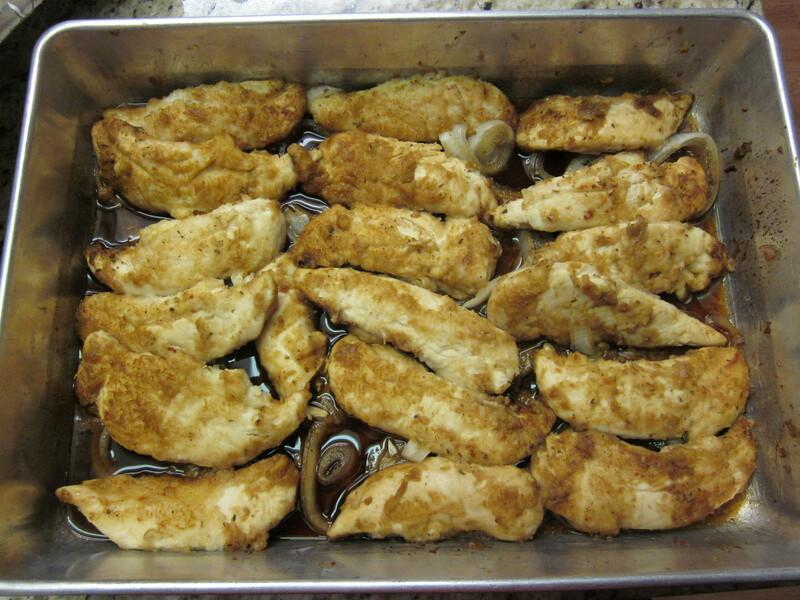 Marinate your chicken in a zip-top bag in the fridge using either Step A or Step B. A. You can marinate it in the sauce ingredients (the last four in the list) and then add the sauce to the pan before baking. 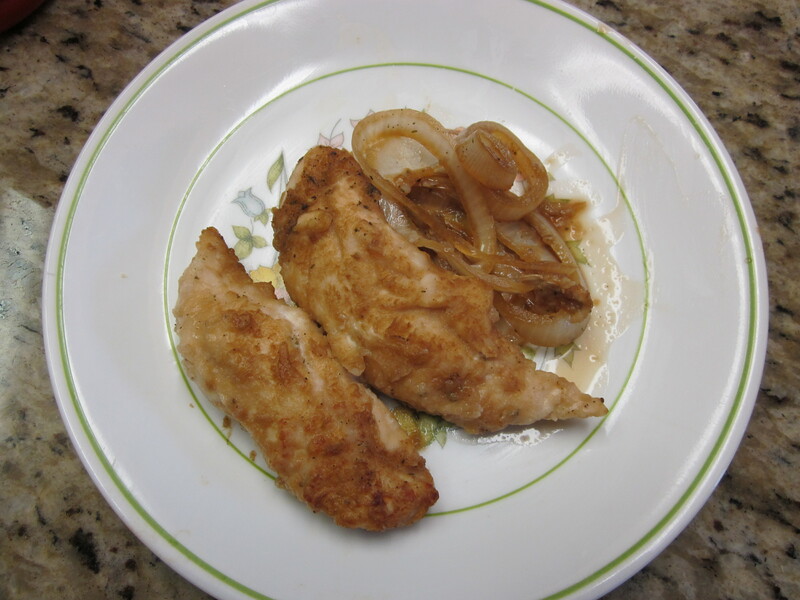 It adds a nice brown color to the chicken, but it can get too salty very quickly with the soy sauce. B. You can marinate your chicken in Italian salad dressing. Just give a quick rinse before proceeding with the next steps. The brown color is missing, but it stays moist and not overly salty. 3. In a brown paper bag, put the flour and rosemary. 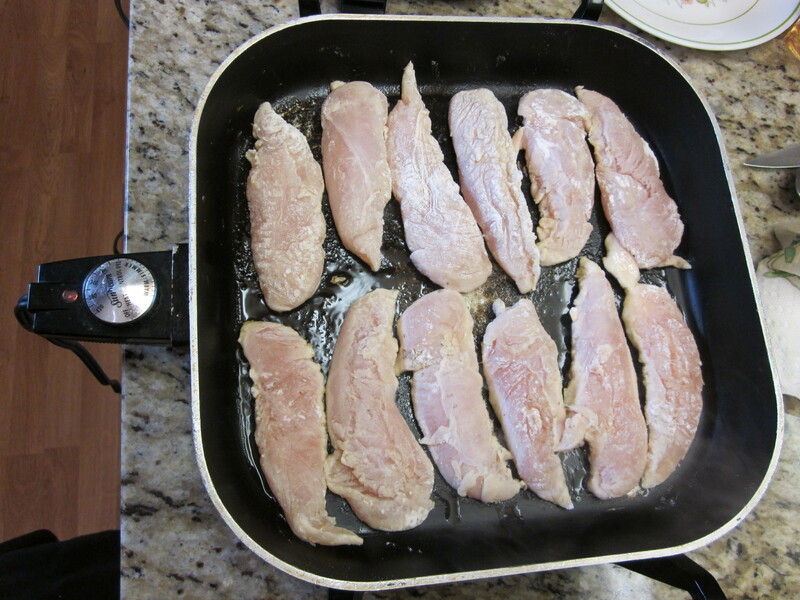 Add the chicken pieces, fold over the top, and give several good shakes so as to coat the chicken with flour. 5. 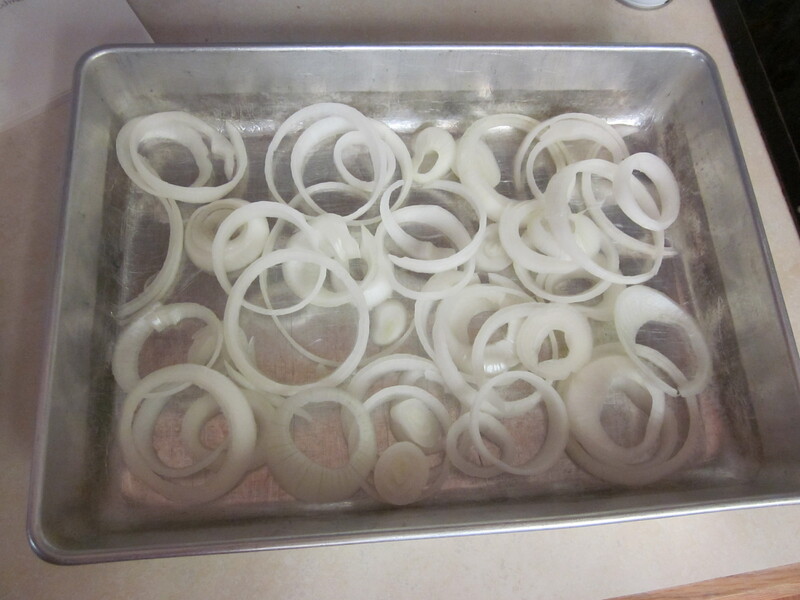 While the chicken is browning, slice the onion into thin rings and put them in a thin layer on the bottom of your baking dish. 6. Combine the last four ingredients to create your sauce if you didn’t do that to create the marinade during Step 1. 7. Put the chicken on top of the onion layer; add in the sauce and the boiling water. 8. Cover tightly with a lid or foil, and bake for 20 – 25 minutes. 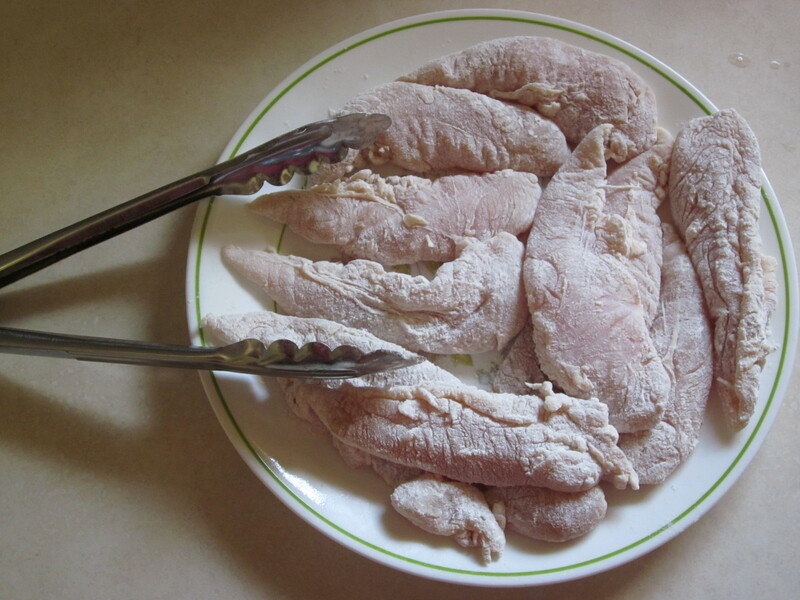 If you are using bone-in chicken, it will take closer to 45 minutes to cook. I took the chicken out halfway and turned the strips over so that both sides were in contact with the sauce which helped create the lovely browned look for the chicken. This is not necessary though – purely for aesthetic reasons. Temperature Tip: When you bring meat out of the refrigerator where it’s been marinating, let it rest on the counter for a while to come up to room temperature. It will cook more evenly in the pan if you let it warm up a bit. It is totally acceptable to let it sit on the counter for somewhere from 30 minutes to an hour. I was at a BBQ class once, and the instructor-chef-man said he lets his beef rest at room temperature for 2 hours without being worried about bacteria or anything. All the chefs and cooks on Food Network also recommend taking the chill of the meat. If you put cold meat in a pan to cook, the outside will often cook much faster than the inside which leaves you with dried-out or burned meat. That’s not good eats. I am a big fan of Penzey’s Spices (see their link on my left side bar! ), and for a few years, they put out a magazine, Penzey’s One. It was a wonderful magazine full of stories about people and the role food plays in their lives. They would highlight certain regional areas or find a theme to gather recipes around. This recipe originally came from a grandmother who was given the recipe on her wedding day in 1948 by her mother. (Penzey’s One: Volume 1, Issue 2, 2005) Even though I’ve changed it just a bit to reduce the salt, I still like that this recipe has history and that there is a connection to a family in the New England area who also eats this. Thanks Barbara Sands for sending Penzey’s your recipe, and thanks to Penzey’s for publishing real life recipes. Happy eating! Well, this sounds yummy. I, too, love Penzey’s. There is one in our neighborhood. I love to go over there and just sniff. There are hardly words to describe my jealousy that there is one in your neighborhood. I want to come sniff too!! !